Here you can see a belt loop. The stitching is very rugged and secure. On the lid portion you can see a zippered compartment (silver/grey area in picture). The black tab looking thing is a leather cover that covers the zipper when the compartment is closed (so the zipper won't scratch your camera). That's if your camera sits that high in the first place (mine does, as you'll see later). This compartment is quite shallow (I don't use it), you can fit memory cards and or lens clothes. Here you can see the inside has two support "dividers" that can adjust to the width of your camera+lens for a better fit. On the underside of the dividers are elastic loops (one on each divider) for you to hold something small like batteries. The velcro that holds the dividers in place is very strong and doesn't detach when support your camera. Well, more accurately, it holds my Canon 400d with battery grip securely. 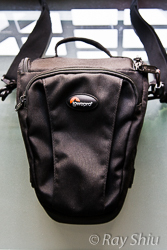 For the minimalist photographer needing a lightweight, lightly padded camera sling pouch for daily use. 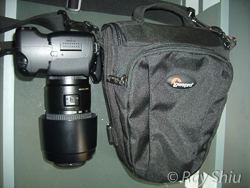 This was the first camera case I bought together with my Canon 400D with 17-85 bundle. I used it extensively until I bought more stuff, then it became to small for my needs so I gave it away to a close friend who really wanted it. It's small, and light with just enough padding for your camera. You don't want to drop it or swing it around but it will provide some protection if you carrying your camera in a bigger rucksack or duffel bag. 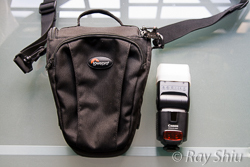 The front pocket expands outwards and can accomodate a Canon 430 EX sized flash. The sides also have loops for attaching lens cases and pouches. I don't like the belt loop being fixed. meaning I have to take off the belt to remove this case from the belt. I would have liked the front pouch to have some padding at least, there's none whatsoever. Weather proofing, I don't think it's totally waterproof meaning you can soak it underwater, but it is water resistant. I've been caught in a light drizzle and the bag kept my gear safe. The front pouch would be the first to get soaked if water gets through because there's no padding to absorb any moisture. A raincover would have solved this issue. 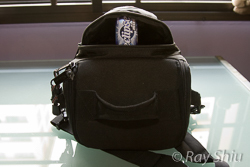 Overall, I find this bag perfect for the days that I'm out with only one lens. I always bring my flash (unless I forget for some reason). so this bag is perfect. 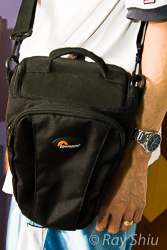 Not too big to be cumbersome for a single camera, lens flash bag. If you wanted to carry other stuff then it's pretty easy to attach something like a lens case or pouch that has attachments that you can use a clip with. 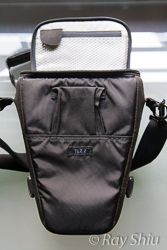 Great bag for your single lens + flash walkaround bag!